Hafliði Hallgrímsson is one of the leading figures in Icelandic musical life, and his work Mini Stories sets the surreal poetry of the soviet-era writer Daniil Kharms to music. Whilst internationally renowned actor Simon Callow brings Kharms’s texts to life, the Icelandic Caput Ensemble reflect the mood with stellar performances of Hallgrímsson’s evocative accompanying composition. 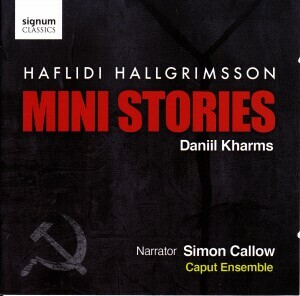 Description: It needs to be said that this is not ‘texts set to music by Hallgrimsson’; it is in equal parts a CD of the weird, bitter, absurd little stories by Daniil Kharms (1905-42), performed pitch-perfectly by distinguished British actor Simon Callow, and Hallgrimsson’s accompanying intermezzi, one for each tale. Kharms (Daniil Ivanovich Iuvachev) was an avant-garde writer in early Soviet Russia, a member of a short-lived Futurist-Absurdist group that attracted the unfriendly attention of the establishment. His writings got him into trouble with the arbiters of Soviet artistic ideals; he was arrested, imprisoned, exiled, and he finally died in prison hospital, probably of starvation. The stories run the gamut from from nonsensical and comical to absurd and nightmarish, with a peculiarly Russian sense of the inevitability of death and horror familiar from many better-known poets and literary figures, here expressed with pungent and disconcerting brevity. Hallgrimsson’s music establishes atmosphere, mostly rather chilly and bleak, with a fragmentary, dreamlike feel; each little piece has its own logical form and shape, though, and makes its own narrative statement, increasingly so as the cycle progresses. The composer revised the work five years after the original date of composition to add ‘background’ musical gestures during the narration, unobtrusively lending a greater sense of unity to the overall piece. English texts. Simon Callow (narrator), Caput Ensemble.